The photos I am going to share in this Halloween 2017 entry are old, in Internet years. I had intended to share some photos I took over the last month depicting some dark Texas history as well as a lovely old cemetery up the road from my house, but I’ve had a significant equipment failure with my camera. I lack the vocabulary to explain what happened but from what I recall from the conversation I had with Mr. OTC, who is sometimes Mr. Tech-Support, a card got corrupted in my camera. It’s really important to me to have an entry up every weekday in October. So I dug through my archives and found a couple of photo series that have not appeared online as much as some of my other photographs and with them I’ll create some photo essays of some of my interesting Texas crawls. If you’re not from central Texas and know the name Jarrell, Texas, it is likely because of the massive tornados that struck the town in 1997, creating one of the most devastating natural disasters I’ve ever witnessed personally, being as landlocked as I am. Arguably the fires we get in these parts are worse but generally with fires, people are able to evacuate with some warning. The Jarrell tornados hit fast and with fury and destroyed so thoroughly that at least one family was wiped from the face of the earth. They were shredded in the winds and enough pieces were recovered to be able to legally declare people dead. Sturdy homes and trailers alike were leveled. We tell ourselves that our weather-predicting capabilities are far more sophisticated twenty years later but when a series of over 20 tornadoes is coming your way, there’s only so fast you can move to safety. In fact, bizarre weather has made it hard to photograph some of the places I want to share here. The Columbus City Cemetery in Columbus, Texas, has some remarkable statues and a couple of pieces of interesting lore. One year massive fires kept me from going out there. This year Hurricane Harvey made a trip impossible. And the last two times I planned to go to a cemetery in Texas where supposedly there is a space alien buried, it snowed. Snow in Texas often borders on catastrophe and it is never particularly pretty more than two hours after it happens because it turns to slush, then into ice, and it’s a muddy, unappealing mess that results in more car crashes (when people like me try to drive on it) than snowmen. But back to Jarrell, Texas. Years ago, Mr. OTC heard of a ghost town called Corn Hill that had a very interesting cemetery. When I hear “ghost town” I think of an abandoned western Main Street with boarded up shops and peeling clapboard houses. While there are a couple of abandoned buildings still standing, Corn Hill as a town relocated either to New Corn Hill (I am not making this up, I swear, and New Corn Hill boasts my favorite Texas cemetery to date) or was absorbed into Jarrell. The cause for Corn Hill dying is, of course, a railroad being laid a few miles in the wrong direction. At its peak, the town had around 350 citizens, a Mason lodge, a school, a post office, a stage stop and several churches. All that remains of Corn Hill are a few buildings and a cemetery. I will be sharing one of those buildings today and the cemetery tomorrow. Yeah, didn’t go inside. This looks daunting but it looks even worse from the side. 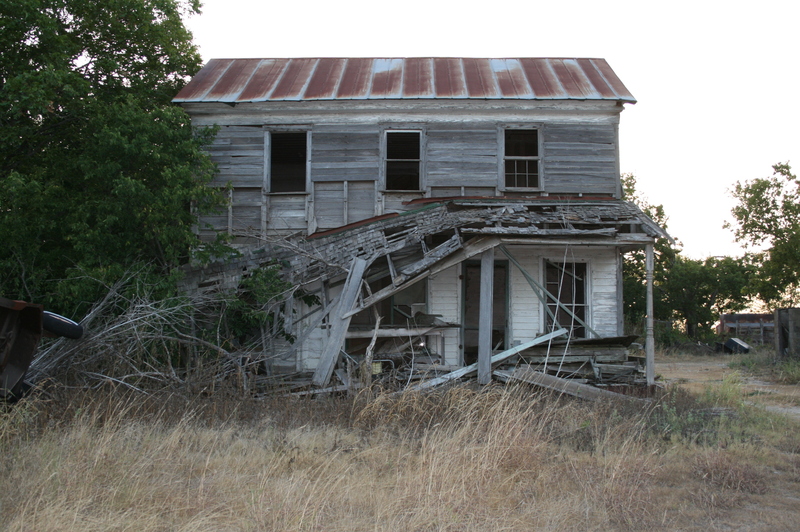 It’s amazing to me that this old house is still standing even after the tornadoes of 1997. I didn’t know the history of this place when I explored it. All I knew was that it looked interesting and that I have a complicated relationship with no trespassing signs. This building was once the hotel and the residence of John Shaver. Located just off I-35, this hotel and stage stop was built in the late 1870s. But mostly the appeal of this building is how creepy it seemed initially. 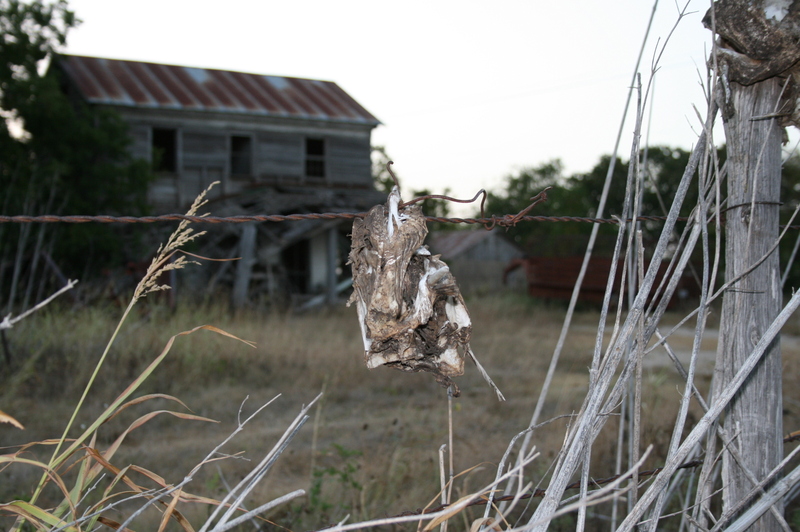 I guess plenty of fisherman use the “spike the head on a fence to skin the fish” method of descaling their daily catch but it will never not be creepy to see dead heads on barbed wire outside an abandoned house near dusk. There is a decided “Texas Chainsaw Massacre” feel to this house.